I must say I’m very fond of Stylophones! The Stylophone, if you’ve never encountered one, is a small, hand-held monophonic instrument played by touching a stylus to a row of metal pads – the edge of a large printed circuit board – laid out like the keys of a piano. It was invented and first marketed in the 1960s, and is sometimes described as the world’s first mass-produced synthesizer. In my view the Stylophone is an indispensable element in the arsenal of the electronic musician – it’s simple, distinctive-sounding, and most types are available at a reasonable price, with patience, from charity shops or on eBay. It’s also possible to make a number of straightforward – and some not-so-straightforward – modifications to it. I have described elsewhere in the blog some of the ones I’ve done. 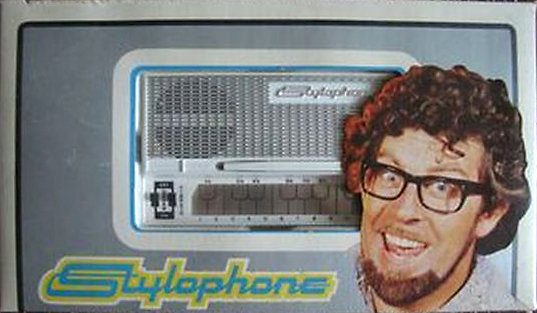 The marketing masterstroke which ensured the eternal popularity of the Stylophone was the engagement of the multi-talented London-based, but Australian-born entertainer, Rolf Harris. 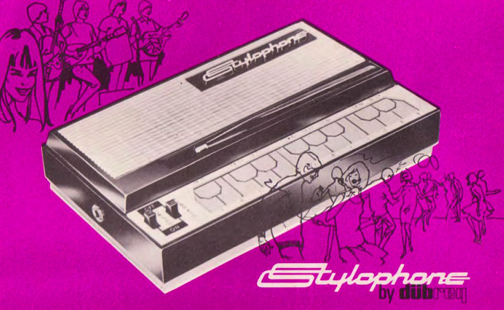 Even before production began, the Stylophone was introduced to the world on Harris’s popular Saturday TV show on the BBC, and, it is said, became an instant hit – despite at first being available only by mail-order from Dübreq at the frightening cost of 8 pounds 18 shillings and sixpence, around ninety-five pounds in today’s money! Over the following decade a number of different versions of the Stylophone were produced. I have a treble – which is all white – a standard black, and a bass – also black. This latter wasn’t a production model, but the circuit diagram that came with the standard showed different component values for all these three types, so I modified a standard to produce the bass register, an octave below. I’ve subsequently modified this to produce a further octave below that – I call it ‘The Double Bass’ – but this is not a modification suggested by Dübreq themselves. 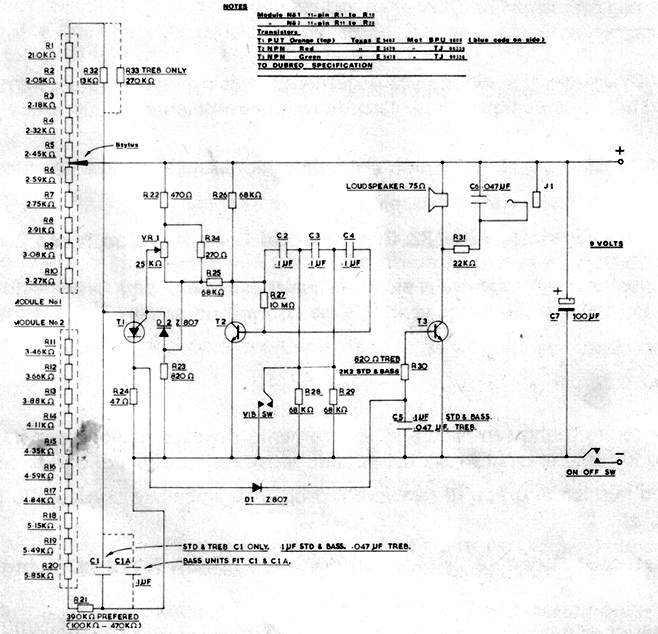 This is a circuit diagram of an early Stylophone. Note the details of alternative components: resistors in the top left and capacitors in the bottom left. There is also a later 1970’s version (the ‘New Sound’) with a fake wood fascia in place of the familiar metal grille. This latter has a feature noticeably absent from the earlier models – a volume control, a useful feature in the days before the ubiquitous earphones. 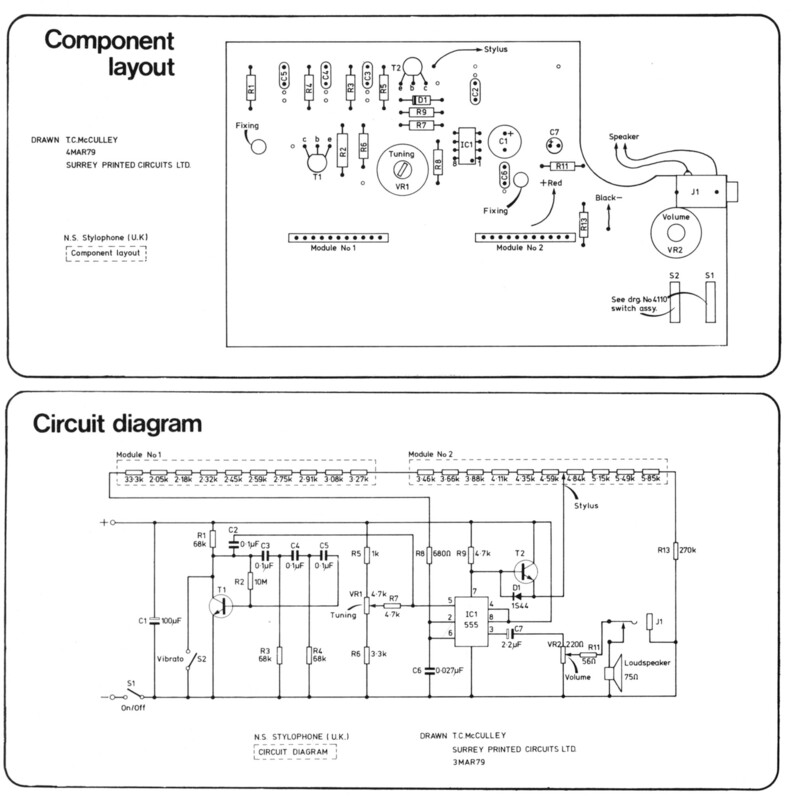 Here is the component layout and schematic/circuit diagram from the booklet which came with it. It was not long after this, in 1975 or thereabouts, when production of the original Stylophone ceased; and this might have been the end of the Stylophone story, had Brian Jarvis’s son Ben not had the idea in the early 2000s of bringing it back. 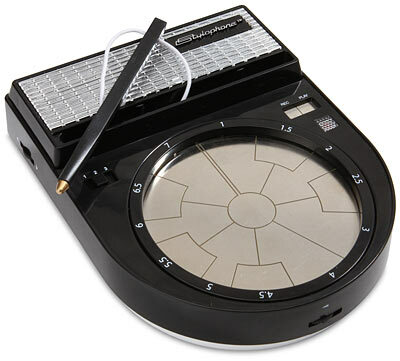 By 2007 the new Stylophone S1 was on sale, sufficiently similar to the original to be instantly recognisable, but with some updated features, including built-in input and output sockets and a three-way tone control. It’s possible to do modifications on all these variations on the Stylophone design, even the S1. Despite the fact that the chip that does all the work in the S1 is very tiny and inaccessible, parts of the pitch and vibrato circuits are available, and the output stage is on a separate PCB. I was able to do some mods on a couple of these. The ‘New Sound’, based on the very common 555 chip is easier to deal with, and I was able to do a lot with mine (see http://wp.me/p25FoK-10). There are many circuits for 555-based oscillators in books and on the internet, and the 555 in the ‘New Sound’ is easily accessible for modding. I haven’t done much with the original Stylophones – but these should be even easier, as the resistors which fix the pitches of the notes are exposed, and it should be possible to do things to these without too much trouble. The biggest problem with the original and ‘New Sound’ Stylophones is likely to be the cost. Since these are sought after by collectors, they can fetch rather higher prices than you might want to pay for something which you intend to experiment on! Many stars – other than Rolf Harris himself – have been publicly associated with the Stylophone. You can read about these on the Stylophone page in the Wikipedia at http://en.wikipedia.org/wiki/Stylophone, and see pictures of them on Stylophonica, ‘the official home of the Stylophone’ at www.stylophonica.com. You can also learn more of the history of the Stylophone at www.stylophone.ws (or www.stylophone.fsnet.co.uk), the Stylophone Collectors Information Site; buy a vintage Stylophone at www.stylophone.com, the Stylophone Sales Center; or even make your own Stylophone at www.instructables.com/id/A-Stylophone! You will also find out about the mighty Stylophone 350S, much larger than the ordinary Stylophone, with two styluses (styli? ), more notes, more tones and a cunning light-sensitive filter/vibrato control. This also went out of production in the 1970s and has not so far been revived. These machines – wonderful thought they are, as you can see – can be seriously expensive, and you would probably want to think twice about having a go at the electronics in it without knowing what you were doing. Having said that, like the conventional Stylophones of the period, the electronics will be relatively straightforward compared to modern devices. A bit like cars, really – in the old days it was much easier for the amateur home mechanic to sort out engine problems: nowadays, there’s very little you can do. The 350S has many different ‘voices’ and that intriguing photocell circuit . . . there’s got to be some scope there. 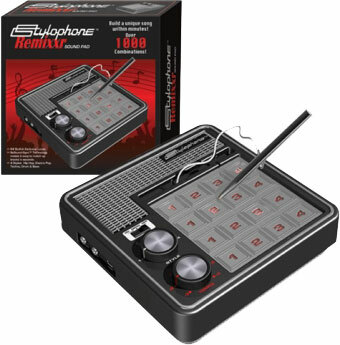 A new type of Stylophone that has appeared in recent years is the Stylophone Beatbox: a drum machine playable – of course! – by means of a stylus, including percussion, vocal percussion and bass sounds, and able to record and replay sequences. I have some functioning ones, which may also be good for circuit-bending, and some non-functioning ones from which the attractive circular playing surface should be useful for other projects. I used the case and the keyboard PCB of one of these for a Stylophone project, but not the sound-producing electronics as there were faults with the ones I acquired which I couldn’t fix. Dübreq’s website at www.dubreq.com suggests there are more Stylophone products in the pipeline, but none, at the time of writing have appeared. Some other websites have been advertising the imminent arrival of the ‘Stylophone Remixxer’, but I’m not aware of any genuine sighting of such an object. hey, where can you get the modules from? Hi, Just to thank you for a very comprehensive & informative website and one I’ve saved for future use. 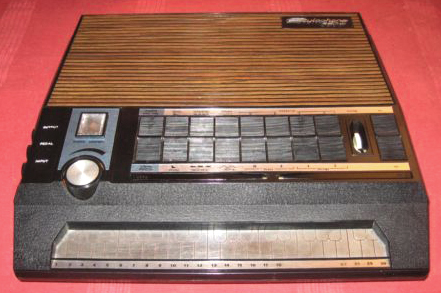 I discovered your site after purchasing an original, early model Stylophone (with blacked out keys), the same I had once owned many, many years ago and, as a result of nostalgia buying I need to play catch-up with the genre. The only problem and why I got rid of the original one I once owned is that I’m not musically gifted and I could’t even play on linoleum if my life depended on it but I’m now committed to get a tune out of my new acquisition ! Thanks for writing, Oz! Maybe you’ll find your own way of playing the Stylophone – even an unconventional one – which gives you pleasure! I’ve just acquired an ‘american’ Stylophone ! Although it has no reference to DubReq, it most certainly is a Stylophone but with a Copyright of c1968 by Pointer System Inc, 64 East Second Street, Winona, Minnesota (US Pat No: 3524356) Note: This Pat No appears on later UK made Stylophones. The importer & distributor is: R&M Merchandisers Co. 5901 North Cicero Ave, Chicago. It’s in the same style as the “New Sound” UK ‘wood’ version but without the volume control. The other differences from the UK model are as follows: 1) Made in Hong Kong. 2) Slide off battery door to allow access & fitting of the PP3 battery. 3) The white case bottom is removed by unscrewing a captive, threaded screw. 4) An additional 2.5mm socket for external 9V DC (next to the 3.5mm amplifier socket). 5) The silver Stylophone logo has an additional ® next to it. 6) Internally, there is a mash up of various components, with 5 transistors. The similarities are: 1) The plastic case moulding bears the same double (ii) symbol. 2) The pcb keys have the ‘blanked out’ keys as the earliest UK models and the pcb base material is mid brown in colour. 3) Comes with additional keyboard number overlay. Lastly, it comes in a presentation box 4 times the size of the Stylophone itself, presumably to give it more American buyer appeal but when the box is opened, the Stylophone is surrounded by printed cardboard spacers !! However, it appears that 2 stick-on labels have been added later, printed in bold type “POCKET SIZE”, perhaps to not put off buyers who may think the organ is too big ? If you require photo of the outfit, could you let me know and how to send them to you. I hope this info is of interest? That’s interesting! I’ve never seen one like this – it sounds like it might be one of these: http://www.stylophone.ws/hk.html. The write-up on that page suggests that these might have been made under licence, rather than being unauthorised copies. Also, their picture of the British-made version shows the ® after the ‘Stylophone’ logo, which is unusual, but obviously not unknown. There aren’t any pictures of the inside, which sounds different from designs I’ve seen before. Some pictures would be great, especially of the internal workings!